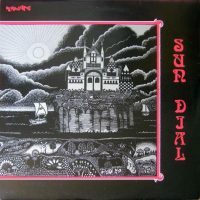 Other Way Out is one of those rare albums I’ve owned on three formats, and yet that sort of obsessiveness still seems inadequate to convey how much I love this album by Sun Dial, an English psych-rock group led by guitarist/vocalist Gary Ramon. No exaggeration, I must have played Other Way Out more than any other LP released in the ’90s—hundreds of times. So, why haven’t you heard it? (Apologies if you have and dig it.) This album should be canonical. But despite being reissued often since its original release in 1990, it nonetheless remains a mere cult favorite. Part of the problem is that the many iterations of Other Way Out mostly have been issued by tiny labels, although in 2006, the big US indie Relapse put out a double CD with several bonus cuts. And then in 2010, the big UK indie Cherry Red did a nice vinyl re-release, so OWO is circulating, but it’s still not reaching as many people as it should. If everyone who’s raved about Mercury Rev’s overrated Deserter’s Songs owned Other Way Out, the world might be in a much better place. LP-opener “Plains Of Nazca” starts in media res with Anthony Clough’s Vox Continental organ drone, then takes off with drummer Dave Morgan’s quasi-funky rhythm and golden spangles of electric guitar and a phantom angelic coo in the distance. Ramon’s voice is shrouded in a sick phaser effect (or is it being run through a Leslie speaker?) as he intones as if stoned immaculate a few psychedelic scenarios seemingly composed under the influence of Owsley. Clough’s organ solo is a fairground fantasia of pure spiral-eyed bliss. After clocking this stunning tune, one worries that Sun Dial may have peaked too early. But no. It gets better. “Exploding In Your Mind” is practically the Platonic ideal of ’60s-via-’90s psychedelia, an upgrade on what the Dukes Of Stratosphear were doing, but with genuine, serious intent. The wah-wah power is strong with this one, and the whole song seems to be flowing through chartreuse magma. The refrain of “colors exploding in your mind” will induce said phenomenon—unless you’re a lysergic virgin, perhaps. This is the part where I always feel transported to a place beyond the Star Gate sequence in 2001: A Space Odyssey. Suffused in a huge swirl of phaser and illuminated by Anthony Clough’s bamboo flute and Ramon’s florid acoustic guitar strums, “Magic Flight” offers a self-fulfilling prophesy of its title. What a spectacular dream. If OWO had only consisted of these three songs, it would be glowing regally in the psych-rock pantheon. But there are yet more thrills ahead. On “World Without Time,” Sun Dial billow out some low-key, semi-baroque bliss rock with hints of early Pink Floyd, augmented by Morgan’s Turkish talking-drum percussion. With “She’s Looking All Around,” the band unveil a rococo power ballad that could—stay with me now—be an alternative universe “Stairway To Heaven” / “Nights In White Satin” hybrid. The record closes with “Lorne Blues,” the most menacing track here, a snarling, low-flying number not too far from what fellow British psych-rockers Loop were doing on Heaven’s End and Fade Out.